Preheat oven to 350°F. Grease and line three 8? round pans. Mix together all dry ingredients (flour, baking powder, sugar, and salt) in a stand mixer with a paddle until fully combined.Mix chunks of butter slowly into the dry mix on a low speed. Continue to mix until no chunks of butter remain, and the mixture becomes crumbly. In a separate bowl, combine all wet ingredients (vanilla extract, egg whites, buttermilk, and vegetable oil), and whisk to combine. On low speed, add 1/3 of the liquid ingredients to the dry/butter mixture. Mix until fully incorporated, scraping down the sides of the bowl as needed. Mix in the remaining wet ingredients in two installments, on a medium-high speed until fully incorporated. Divide evenly between the prepared cake pans. Bake for 30 minutes, or until a skewer comes out clean. Allow to cool for 10 minutes, then run an offset spatula around perimeter of the pan to separate the cake from the pan. Place cake layers on a rack to finish cooling. While the layers bake, make the fondant cake decorations. I used just a touch of pink fondant to make a small tongue, and shaped an oval out of black fondant for the nose. I also used some circle cookie cutters for Pete’s eyes. Place prepared fondant onto parchment paper to allow it to firm. To assemble the cake, frost each cake layer with yellow buttercream, and apply a thin crumb coat. Freeze cake for 5 minutes to allow the crumb coat to set. 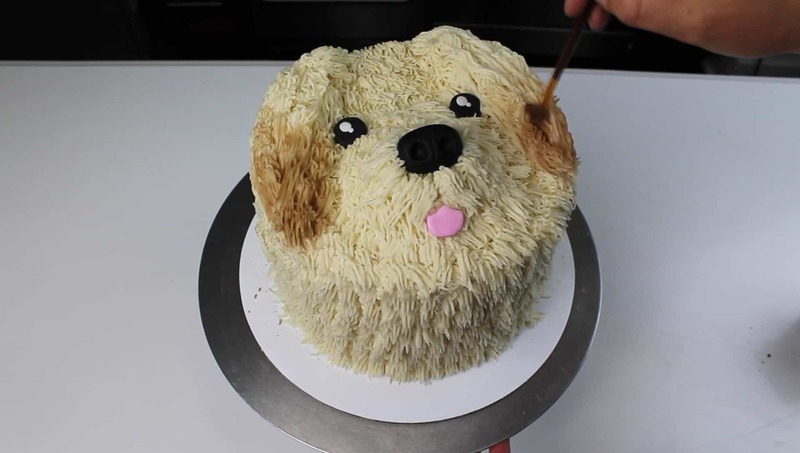 Make a small mound in the center of the cake for the puppy’s snout, and add two oblong mounts onto opposite sides of the cake for the puppies ears . Place remaining frosting into a piping bag with a grass tip, and pipe “fur” onto the entire cake. Add fondant accents (eyes, nose, and tongue onto the cake. Place cake into the fridge for 15 minutes to allow the buttercream to firm. I also added a bit of cocoa to the tips of the ears and the snout using a small, clean paint brush. I want to make the rose water cake but decorate it like this dog cake. How can I get the exact same colors of the dog cake but have it taste the exact same as the rose cake? I’d just swap out the extracts! Will it still have that tan color? no, but you can add a drop of two of brown gel food coloring to get the same effect! Or even a tiny bit of cocoa powder. I’m making this cake for a friend’s daughters 1st birthday. They’re requesting cream cheese frosting. Could I decorate this cake using cream cheese frosting? If so, do you have a recipe to recommend? I think it would be more difficult to pipe with cream cheese frosting, but I’ve never tried it before! What kind of flour did you use? Self raising? 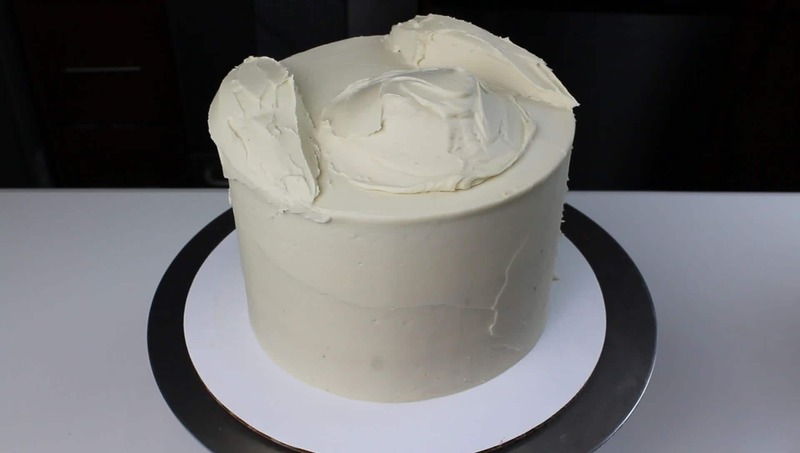 It looks as if you have 2 types of buttercream, one white and one tan coloured- is the recipe the same for both? all purpose! same recipe, just added a bit of cocoa to make the tan frosting for the fur!